Holiday travel means time to listen to audiobooks in the car or while you're cooking fantastic holiday treats and meals. 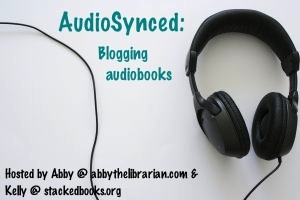 Even if you're not traveling (or cooking) for the holidays this year, you just may find your next awesome audiobook by checking out some of these audiobook reviews from around the blogosphere. Didn't get to an audiobook this month? Don't worry! Kelly will be hosting AudioSynced at STACKED next month. Looking for more audiobook reviews? Check out Audiobook Jukebox, a comprehensive collection of blogger audiobook reviews. What's involved in making an audiobook? John Schwartz explores the audiobook experience for the New York Times in his article "Sound Check". Chitty Chitty Bang Bang by Ian Fleming, read by Andrew Sachs, reviewed by Lee at Reading With My Ears. Lee says, "Sachs reads the novel beautifully." First Light by Rebecca Stead, read by David Ackroyd and Coleen Marlo, reviewed by Lee at Reading With My Ears. Lee says, "Unfortunately, neither narrator seems completely comfortable with the English accent, so the dialogue always sounds a bit stiff and artificial." The Hero's Guide to Saving Your Kingdom by Christopher Healy, read by Bronson Pichot, reviewed by Beth at Nerdy Book Club. Beth says, "This is one of the most memorable audiobooks I’ve listened to in recent history and that is all thanks to the sheer comic genius of actor Bronson Pinchot, who not only narrates this audiobook, he performs his heart out in it." The Land of Stories: The Wishing Well, written and read by Chris Colfer, reviewed by Lisa at Shelf-employed. Lisa says, "As one might expect from Glee star, Chris Colfer, the narration is superb." Moon Over Manifest by Clare Vanderpool, read by Jenna Lamia with Cassandra Campbell and Kirby Heyborne, reviewed by Heidi at Bunbury in the Stacks. Heidi says, "[Jenna Lamia] is the type of narrator that infuses a book with life and makes the audio into an experience that is richer than you could have had merely reading the story on the page..."
Colin Fischer by Ashley Edward Miller and Zach Stentz, read by Jesse Eisenberg, reviewed by April at Good Books & Good Wine. April says, "Colin Fischer is certainly an audiobook that I would recommend to audiobook aficionados and newcomers alike." Days of Blood & Starlight by Laini Taylor, read by Khristine Hvam, reviewed by Brenda at proseandkahn. Brenda says, "Khristine Hvam turned in another flawless performance." Dodger by Terry Pratchett, read by Stephen Briggs, reviewed by Lee at Reading With My Ears. Lee says, "He [Stephen Briggs]'s good; he's an excellent match with Pratchett's rapid-fire jokes, whiplashing plot developments and all-around silliness." Speechless by Hannah Harrington, read by Emily Bauer, reviewed by Sarah at YA Love. Sarah says, "[Emily Bauer's] voice fits Chelsea’s character, especially how she’s able to make herself sound snobby and catty like Chelsea is at the beginning. I noticed, though, that as the story continued and Chelsea grew as a character, Emily Bauer’s voice became more compassionate and down to earth." Tender Morsels by Margo Lanagan, read by Michael Page and Anne Flosnik, reviewed by Heidi at Bunbury in the Stacks. Heidi says, "I do recommend the audio, but not so enthusiastically that I would insist it were an improvement on the book itself." Buckingham Palace Gardens by Anne Perry, read by Michael Page, reviewed by Lee at Reading With My Ears. Lee says, " [Michael Page] has a very actor-y voice -- rich and resonant with lots of variation. He is very good at characterization -- the more obvious choices through social class, but I particularly admired the subtle differences between his voice for Pitt and for Narraway..."
Clara and Mr. Tiffany by Susan Vreeland, read by Kimberly Farr, reviewed by Melissa at Book Nut. Melissa says, "I wanted to like this one, and sometimes I did. The narrator was good -- nothing spectacular, but not annoying, either." The Dangerous Animals Club, written and read by Stephen Tobolowsky, reviewed by Heidi at Bunbury in the Stacks. Heidi says, "...Stephen Tobolowsky is a damn fine storyteller." The Lost Painting: The Quest for a Caravaggio Masterpiece by Jonathan Harr, read by Campbell Scott, reviewed by Lee at Reading With My Ears. Lee says, "[Campbell Scott's] low-key style suits nonfiction, as he steadily but patiently tells us the story of this paper chase." The Professor and the Madman, written and read by Simon Winchester, reviewed by Lanea at Books for Ears. Lanea says, "Winchester makes for a wonderful reader–his diction is lovely and his pacing is good throughout, and his accent is just right for this subject matter. I’m looking forward to listening to other books of his." Seriously... I'm Kidding, written and read by Ellen Degeneres, reviewed by Jeanne from Books for Ears. Jeanne says, "If you have seen Ellen DeGeneres doing standup or hosting her show, you have a good idea of what you are in for here. She is off the cuff, engaging, goofy and lighthearted."